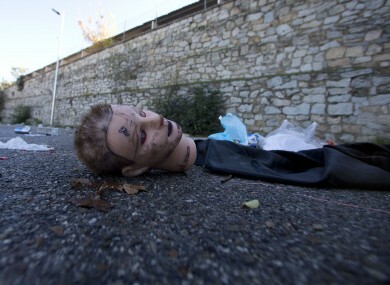 A mannequin's head, bottles and and other debris lie in the Madrid Arena venue car park Madrid after the incident. PARTYGOERS STAMPEDED AT a huge Halloween event in Madrid in the early hours of this morning, creating a terrifying human crush that killed three young women, Spanish police said today. Many young people were in tears as they battled against a human tide for the exits doors in a panic apparently sparked by someone throwing a flare, according to police and witnesses. Some of the doors to the Madrid Arena stadium, which has a capacity for up to 10,500 people, had been sealed, one witness at the “Thriller Music Park” party said. The crush, apparently in a passageway in the stadium, killed three women aged between 18 and 25 and left another two women with grave injuries, police officials said. A witness described chaos with people fighting for a single door, a waiter trying to resuscitate one of the victims on the bar, and security agents pulling at fleeing youngsters. “It seems to have been provoked by a flare that someone threw into the stadium,” a police spokesman said. Police said they began fielding telephone calls at about 4:30am local time about a crush at the party which had promised a “theatrical atmosphere” and a costume contest based on Michael Jackson’s “Thriller” video. “There was a human blockage at the one exit they had because the others were closed so that no-one could go out that way,” one of the youngsters at the party, Sandra, told Cadena Ser radio. “There was only one door, there was a human blockage with a lot of security staff pulling people,” she added. Officers, who completed an evacuation of the stadium by 7am, had already opened an investigation into whether the site had respected safety rules. Fernando Prados, duty chief of Madrid emergency services, was on duty at the time of the disaster. “We received a call at about 4am saying that there were several unconscious girls and when arrived there were five girls between 18 and 25 in respiratory arrest,” Prados said. “We performed resuscitation on them and we managed to get a pulse for three of them,” he said. One of those women, however, died on the way to hospital, he told Cadena Ser. An employee from a nearby club said he believed there may have been too many people inside. A police van and several police cars were at the stadium, which was closed off as police inspected the site under the scrutiny of a crowd of photographers and television cameras. Email “Halloween party stampede kills three in Madrid”. Feedback on “Halloween party stampede kills three in Madrid”.